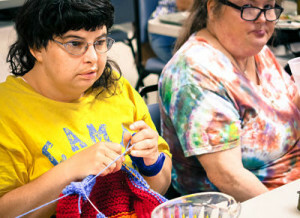 Optimae Home and Community Based Services (HCBS) offer a personalized approach to providing services for adults with mental disabilities and other handicapping conditions. We provide individualized support that allows our customers to experience success and satisfaction in the community-based living environment of their choice. Services are provided in the customer’s home and other community-based settings and are available 24 hours a day. Optimae Home-Based Habilitation Services (HBHS) assists individuals with serious and persistent mental illness with the acquisition, retention and improvement in skills for living in the community. Services are provided in the individual’s home or community and allow them to live in the most integrated setting appropriate for their needs. The services assist in the daily living needs of the customer and can be provided at any time of the day or night that is necessary to meet the individual’s needs. Services include adaptive skill development, assistance with daily living activities, community inclusion, transportation, adult educational supports, social and leisure skill development, protective oversight and supervision. Optimae Supported Community Living Services (SCL) helps individuals expand their abilities and empowers them to be successful in valued roles within their chosen living, learning and social environments. Community Support Services (CSS) provide an array of integrated services and supports to persons with a serious mental illness. Services help customers live successfully in the community with the supports they need and move toward a personal vision of recovery. An interdisciplinary team provides a range of services including assessment and service planning, monitoring of mental health symptoms, medication management, personal support and problem solving assistance, development of natural supports and coordination of appointments and transportation. Intensive Psychiatric Rehabilitation (IPR) provides individuals with mental illness additional rehabilitation services that aid in their recovery. It helps customers choose where to live, learn, work and socialize, while teaching them commitment to set goals and giving them the confidence to reach them. Guided by values of choice and self-determination, IPR participants set goals that enhance their lives. They receive support as they reach to fulfill these goals through one-on-one meetings with specially trained IPR practitioners, as well as group sessions.